Disclaimer: In posting this event Aleph Melbourne does not necessarily endorse the views of the organisation hosting this event or that of the speakers presenting at it. Aleph Melbourne also advises that there are multiple ‘Torah perspectives’ on homosexuality, such as that of Masorti and Progressive Judaism, which offer a more inclusive and accepting perspective to that of Orthodox and Ultra-Orthodox Judaism. 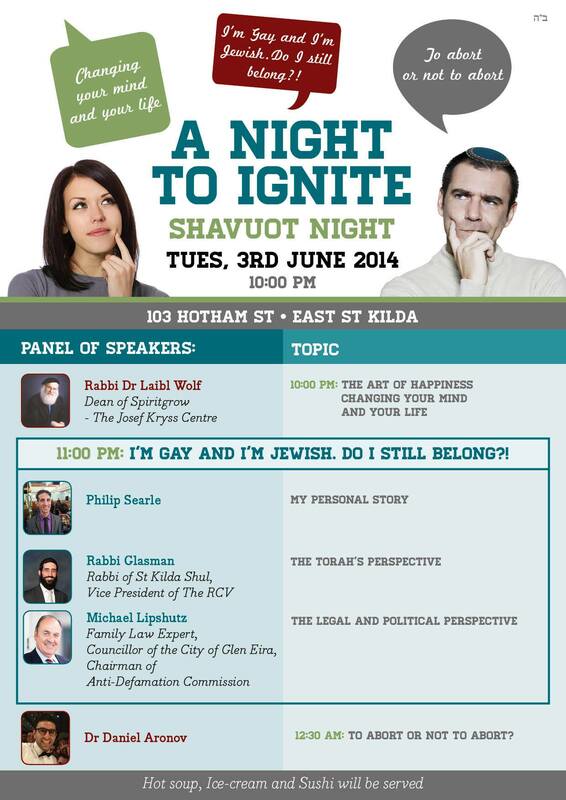 This entry was posted in Culture/Tradition, GLBTIQ, Human Rights, Jewish and tagged DaMinyan, Gay, GLBTIQ, Homosexuality, Jewish, Melbourne, Michael Lipshutz, Moshe Kahn, Philip Searle, Rabbi Yaakov Glasman, Shavuot. Bookmark the permalink.